Take the worries off your shoulders when planning your festivity. Whether it may be a holiday company party, retirement, anniversary, school hockey or track banquet, rest assured we will focus 100% on your gathering. We offer The Grand Buffet (for 50 – 410 guests) which includes 3 entrées of your choice, hot vegetable, potatoes & rice, tossed salad, cole slaw, pasta salad, pickles/olives, hot rolls/butter, coffee/tea & dessert. School events may take advantage of our Student Menu, priced to help schools get the most out of their limited budgets, and the menu is geared to the tastes of young adults. We also offer a served dinner menu which includes a salad, entrée, vegetable, potato or rice, rolls/butter, coffee & dessert. To guarantee proper service, we limit this option to 150 guests. 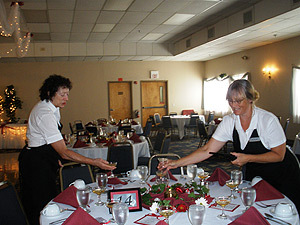 Another option is to have an all hors d’ oeuvres party, with many selections available.